Elon Musk and his aerospace company SpaceX made history on Friday morning when its Dragon spacecraft splashed into the Atlantic Ocean after a successful five-day trip to the International Space Station. There were no people on board the capsule, but its re-entry into the earth's atmosphere marked the first roundtrip to the floating laboratory by a privately-owned spacecraft and one of the biggest tests for the Dragon. The goal for SpaceX and others competing in the new space race, such as Boeing with the CST-100 Starliner, is to perform manned missions to outer space for NASA and propel the government agency to spaceflight capabilities again. Since the government agency responsible for spaceflight shut down its space shuttle program eight years ago, NASA has paid Russia to fly its astronauts to space. Soon, if all goes as planned, SpaceX and Boeing will compete for those contracts and launch the manned-missions from U.S. soil. But before that happens, the private companies need to complete a series of tests to prove their spaceships are safe to transport the astronauts. 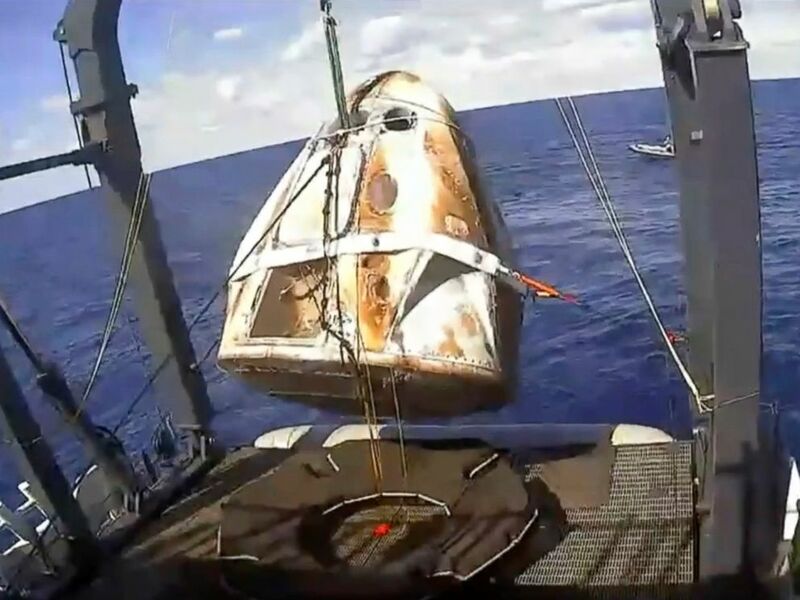 In this image from video made available by NASA, the SpaceX Crew Dragon capsule is hoisted onto a ship in the Atlantic Ocean off the Florida coast after it returned from a mission to the International Space Station, March 8, 2019. • The first commercially-built and operated American crew spacecraft and rocket to launch from American soil on a mission to the space station. • The first commercially-built and operated American crew spacecraft to dock with the space station. • The first autonomous docking of a U.S. spacecraft to the International Space Station. • The first use of a new, global design standard for the adapters that connect the space station and Dragon. These adapters will also be used for the Orion spacecraft for NASA’s future mission to the Moon. "A critical step in validating the performance of SpaceX’s systems, Demo-1 brings the nation a significant step closer to the return of human launches to the space station from U.S soil for the first time since 2011, when NASA flew its last space shuttle mission," a statement from NASA said on Friday. "However, NASA and SpaceX still have work to do to validate the spacecraft’s performance and prepare it to fly astronauts." SpaceX has said it hopes to get the capsule approved for a manned flight in July and Boeing plans to test its capsule next month.